The main reason for developing Premium Proxy Switcher was making proxy usage process more user friendly. We collected all our past experience (over 6 years) and created easy to use software which contains all features for beginner and advanced users at the same time. Unlike other proxy addons for Firefox we did not make complicated interface. Right after installation you could start using it, no documentation or special knowledge is required. All operations are done on intuitive base and with just single click. At the same time such powerful tool like Premium Proxy Switcher is absolutely FREE for anyone. You do not need to have our VIP password to enjoy all its features. You can simply use it with any other proxy servers’ provider who allows users to fetch proxy servers from URL. So, why you are still wasting your time? It is quick to do and sounds fantastic, simply click here and allow Firefox to install it. On request restart your browser and enjoy the new level of proxy usage. * Automatically loads proxy servers every 1-30 minutes from our VIP zone or from user specified URL. * Automatically changes proxy server every 1-30 minutes, that in turn increases your privacy level since your requests will be sent though different proxy servers. * Select any proxy server from available proxy list with just a single click. * Delete selected proxy server from the list if it is not working any more and switch to random proxy server from available proxy list. * Enable or Disable proxy server usage in Firefox with single click. * Manually load proxy servers from our VIP section or user defined URL. * Display proxy country in available proxy list menu, so user could easily select necessary one for that particular moment. * Add shortcuts to all commands for those users who prefer to do everything fast (with keyboard). * The possibility to manage proxy list manually with help of keyboard. * Check proxy server before it will be used by Firefox. The dead ones will be automatically removed from the list. That will allow user save lots of time searching good one for his particular country or region. * Daily download 5 FREE sample (fast and stable) proxy servers from VIP zone. If you have any suggestion how to improve Premium Proxy Switcher, any new feature which should be added with next update OR may be you have found any bug, please feel free to post it here. * There was security issue connected with ‘eval’ function usage to parse JSON data. Since JSON parser is included only in Firefox 3.5 and official JSON parse script has some bugs with Firefox 2.0 we have decided to store all data in our own format (that in turn reduces traffic usage, since data is better packed). * Also we fixed little bug with error which occurred on first run. The preferences window was displayed before country and port list were downloaded. * One more security issue related to SetInterval() function usage was fixed. The function was changed to more secure analogue nsITimer. * Also one more interface bug was fixed. ‘Enable proxy server’ menu item remains enabled even if no proxy server was selected. * Very useful feature was implemented which displays proxy server’s country flag. The first suggestion was to place just a country code but during beta tests it got clear that such codes are difficult to read and to make process more comfortable we placed country flag instead. Since one cannot remember all country flags we also added hints with country name. BTW we are going to implement proxy checking in our engine, so you will not need to use some other third party proxy checking programs. * As it was requested by Andres Hernandez (the Firefox reviewer) the little bug with country list load was fixed. Some users could experience slight problem with downloading proxy servers from our VIP zone. * Also we have changed preference window’s GUI a bit. Since automatic proxy download and automatic proxy switch belongs to both: VIP and third party services, we moved them to separated box. * Since some user cannot understand the meaning of word CUSOMAIZED we have changed label to ‘third party proxy service’. We hope now they will stop posting fake revues. Premium Proxy Switcher 1.0.9 comes with lots of new features and little bugs fixes. * We have added shortcuts to all operations, so now you do not need to use your mouse to switch, delete, load, enable or disable proxy servers. The key shortcuts were selected to be easily reached with single hand. * We add cute and meaningful icons to each menu item. You do not need to read the whole menu any more. You can easily find appropriate operation you need by watching the icons. * We improved proxy parser for third party proxy URL. Now all proxy servers could be even in HTML format, separated with words or other tags. The addon will try to find IP in format A.B.C.D and the port will be taken max 5 digits next to it. That means 99% third proxy provides URLs will work with Premium Proxy Switcher. * Since many users claim that we do not count free users, here is another innovation you will definitely like. Country flags work for third party proxy provider URLs (case you do not understand the price of our present, that feature will load 30% of our servers, each proxy should be tested against 200.000 different IP ranges to identify its country). * Some users complain that it is a bit complicated to find out what they have to do after proxy list is downloaded. So we have changed the logic and if you have no proxy server selected, after download the random one will be automatically selected. * We add possibility to switch proxy servers even if proxy server is disabled for browser. * We add some more informative messages to help users understand what they are doing wrong and how to solve the problem. * Also we translate couple of messages to Russian, before that they were only on English. * We increased allowed automatic download and automatic change interval from 30 up to 60, as it was requested by our users. * We were asked many times and finally we have added the option which will make everybody even more happy. As you know before today there was only one option when you used to work with third party proxy service. You could upload proxies to the firefox plugin only from the url with proxies. Forget about this. Now you add proxies from the third party source with simply copy/paste action. Great, isn't it? As for technical nuances, when you add proxies by your own(copy/paste) they will be always on top, above proxies from our VIP zone if you have some or above the proxies uploaded through the url. * Also we brought some more comfort with proxy selection. Before, when you used to mark the proxy you wanted to use, after selection it used to go at the bottom of the list, now after selection the proxy stays in the position it used to be before marking. Also the selected proxy servers are shown with bold numbers. This is little, but really good thing to make your proxy usage much more comfortable. * If you setup proxy server from the Firefox's settings menu the addon will not just change its state but will show you what proxy server (IP:PORT) you have set in Firefox. * The bug with third party proxy service, when we could not identify some country of the uploaded proxy is sorted out. Now everything works fine (there was no white flag with question mark). * As you already noticed, with third party proxy server provider we show only 20 proxies in addon. This was done because of some ‘smart’ guys who used to upload proxy list with over 5000 proxy servers at one time. Exactly that overload our server during the first days when this option was added to our addon. To sort out the problem and speedup addon, we decided to cache recently checked proxy servers on client’s side. So, if you already used the proxy server before, then addon will automatically detect its country. That at the end will mean faster proxy list load. As for new ones they will be detected in the old way, with help of our server resources. * We fix the bug when proxy switch operation could cause the hidden Firefox error, if there was just one available proxy server in the list. Neat program but . . .
Not fatal but irritating. What can I do to make it go away? First of all thank you very much for you report. The problem is that you have selected automatic proxy download every 5 minutes, plus you have selected our service as proxy source. If you have our VIP password then please enter it in the field ‘Your VIP code’ otherwise If you have proxy from some other third party proxy provider please use their URL and enter it a bit down, in the field ‘User your own URL’. If you do not have nor your URL neither our VIP password than simply disable automatic proxy load. You do not need it since you do not have any remote proxy sources. You can still use our addon with manually loaded proxy list. Simply click on the menu item ‘Manage proxy server’. Case the problem remains please let us me know. p.s. with next update we will add automatic configuration checker to prevent such errors. HIF, I have just read this all of the information which you have given here. And I just want to say that its really very useful as well as the much fine. But as I have heard that when starting Premium Proxy Switcher you can choose between using the developer's premium VIP services and using your own URL. And the another thing is that there is no difference if you have the VIP code or you don’t have it. Oh I see, that is really very useful feature. To be honest I have no idea why such a good idea does not come out minds before With next update we will add it for sure!!! i'm a premium subscriber and i'd like to see maybe opera included in being able to switch proxies for that browser. sometimes i browse with firefox and do my secret stuff with opera. Thunder is absolutely right, Premium Proxy Switcher works only for Firefox but we are currently working on new version of Premium Proxy Switcher which will work for any browser. Do you plan on making it work with Firefox 4? Actually started from the first day when we launched Premium Proxy Switcher as Firefox addon we had no intention to develop it according Firefox versions. The matter is that Firefox gets its new versions very fast and thus with every new version already coded add-on won’t work in no way. And to be honest re-coding addon every three-four months is too complicated and too expensive since this addon is free and almost brings no money. The second problem why we had no plans in developing Premium Proxy Switcher for Firefox 4.0 and so on is that, that we are too sized by Firefox in coding. This means that though we want to add more features to our add-on Firefox by its own doesn’t allow to do so according their safety rules. For example with our add-on, there two options to upload proxies. From our websites as VIP member and as a regular FREE user. Those ones who has VIP code have more options when uploading proxies to our Premium Proxy Switcher. They can upload proxies under several very useful options like speed, uptime, ping and so on, while free users can’t use these options. We wanted to add proxy check engine to our add-on so our VIP members and FREE users would have equal rights(they would have the ability to use the same options, since checking proxies on user side would give almost the whole required information for sorting them). But here came the problem, according to Firefox security rules we CAN’T add proxy checking engine to our add-on. We tried to talk to many people from Firefox support team, trying to explain the situation but without no result. We weren’t allowed to add proxy checking engine to our add-on. 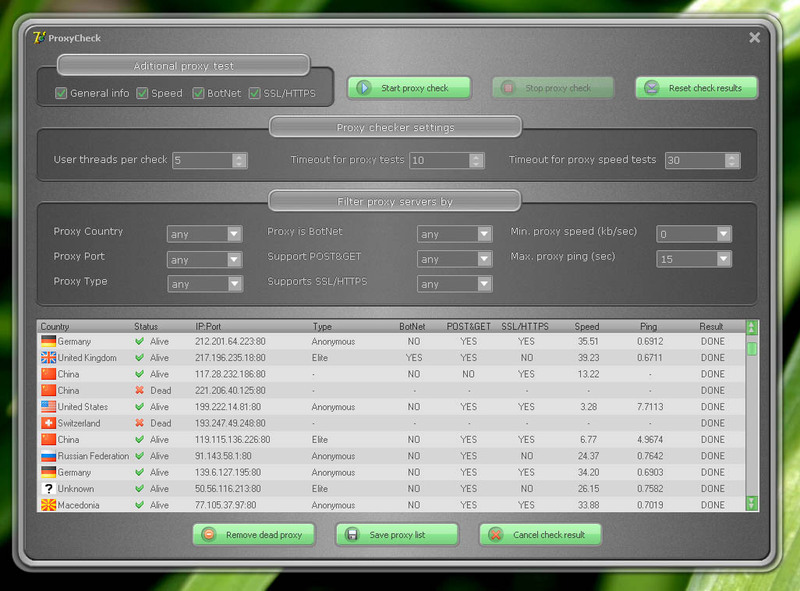 Though if there would be such engine it would be a great chance for our FREE users of our Premium Proxy Switcher. Also, after we launched Premium Proxy Switcher as Firefox add-on we got thousands request to develop the same style add-on for the rest of popular browsers. We could do and we wanted to do, but from the other hand it comes too complicated to re-write add-on with every new Firefox version plus write and re-write our add-on for other web browsers, so almost 6 months ago we made a decision which will make happy all our PAID and FREE users. We started to write absolutely stand alone proxy switcher which will work with ANY web browser and which will give absolutely equal rights to PAID and FREE users. Plus, we took into account many request regarding options which should our proxy switcher, so at the end, it will be SUPER Premium Proxy Switcher Btw, if you have any request, or you need any special option, please let us know. As for day when our brand new Premium Proxy Switcher will be launched(the name will stay the same), it was already ready by the end of February but he came our holiday time and all our team went out. I’m sorry to inform you about this, and make you wait for this super update. But when we are back from holiday, maximum one week(beginning of April) you can enjoy absolutely renewed and absolutely independed version our Premium Proxy Switcher. It will work with any browser and it doesn’t matter what version of browser you have. It will be the most magnificent product we ever issued!